Is Running Equivalent to Swimming? Running and swimming are beneficial for your health. Both provide cardiovascular conditioning for heart heath, help you lose or maintain your weight, help prevent diabetes and reduce stress and depression. However, running and swimming are different in several fundamental ways, so although you can derive similar benefits from both, they're not equivalent. 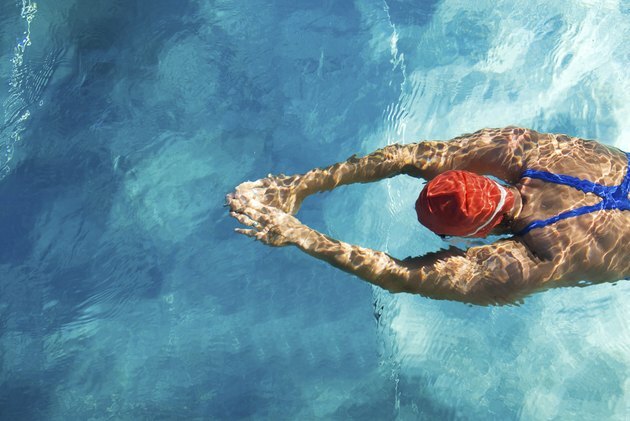 Still, you can combine or alternate swimming and running workouts into an excellent cross-training routine. Consult a doctor before starting any exercise program. You can burn roughly the same amount of calories running and swimming, so the two exercises are equivalent in one regard. You will burn 704 calories if you run for an hour at a 10-minute-per-mile pace, according to NutriStrategy. This is the same calorie amount that you burn swimming fast freestyle laps for an hour. However, you will burn 1,126 calories in an hour if you run at a six-minute-per-mile pace. One significant difference between running and swimming is the amount of impact on your body. Swimming is a zero-impact sport, which makes it ideal for soothing stressed muscles and rehabilitating after an injury. Your body takes a pounding when you run. If you have a condition like arthritis, running can worsen it. Swimming, on the other hand, is highly recommended for easing the pain of arthritis and loosening your joints. There is no equivalence in the speed of runners versus swimmers. Elite runners travel more than three times as far as elite swimmers in the same amount of time. Swimming 100 meters is roughly the same as running 350 yards. Because of the pool's cool environment, expect your heart rate to be about 10 beats per minute slower than a runner's heart rate. In addition, you use different muscles in swimming than in running. Whereas running mainly works the lower body, swimming works the lower body with your kick and the upper body with your stroke. Running is easy; everyone knows how to do it, or can start the exercise quickly. Swimming can be difficult, particularly if you aim to do it with excellent technique. It's a skill developed over time, and requires plenty of practice and coaching. In addition, you need to learn different strokes to work all your body's muscle groups. Outside; How Does Lap Swimming Compare With Other Aerobic Workouts?